At the close of 2016, the LAT had released a total of 45 decisions, and by the end of 2017 that number grew to 413, demonstrating the expediency of the LAT and the rate at which information is becoming available. 84 decisions have already been released to date in 2018, which suggests that the total number of decisions may double this year. While our initial reporting on the Trending Results in 2017 before the fourth quarter suggested a growing trend towards convergence, subsequent releases from the LAT in 2018 provided an additional 67 decisions impacting the 2017 results. With the fourth quarter now updated, the Trend Analysis demonstrates that 58% of the decisions are in favour of the insurers, while only 33% are in favour of the applicant. The remaining 9% are those that did not render a decision or was considered as a split decision, in which both parties were successful to some degree, and excluded any motions on costs. These results were based on a far more statistically relevant sample size of 342 decisions. The LAT Year 2 – Have we settled in? It’s a tricky question to answer. It requires identifying trends, understanding whether the trends will continue, and what specific factors may be driving them. 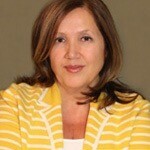 Traditionally, we get this information at industry events and educational forums — and largely it is retrospective. While this approach continues to serve the industry, it is not sustainable given the volume and rate by which information is being released. Further analysis of the success rates relating to specific issues in dispute may help explaining the trends. A closer look at how stakeholders are succeeding with MIG, NEB, CAT and Assessment disputes provides additional perspective. A total of 67 MIG decisions were released in 2017, with 75% of the decisions in favour of the insurer and 25% in favour of the applicant. While there appears some minor convergence of the for and against over the course of the year, the gap remains considerable. 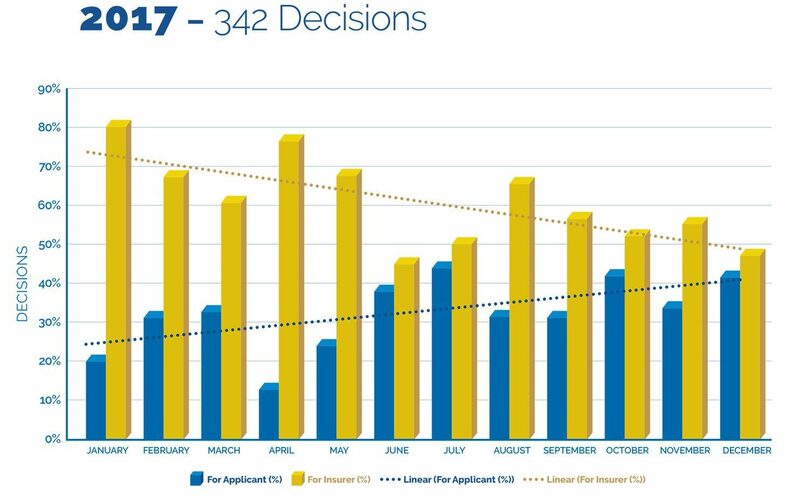 A total of 35 NEB decisions were released in 2017, with 71% of the decisions in favour of the insurer, 20% in favour of the applicant, and 9% split decisions. Similar to the MIG, there is some minor convergence over the course of the year, however this gap remains striking. 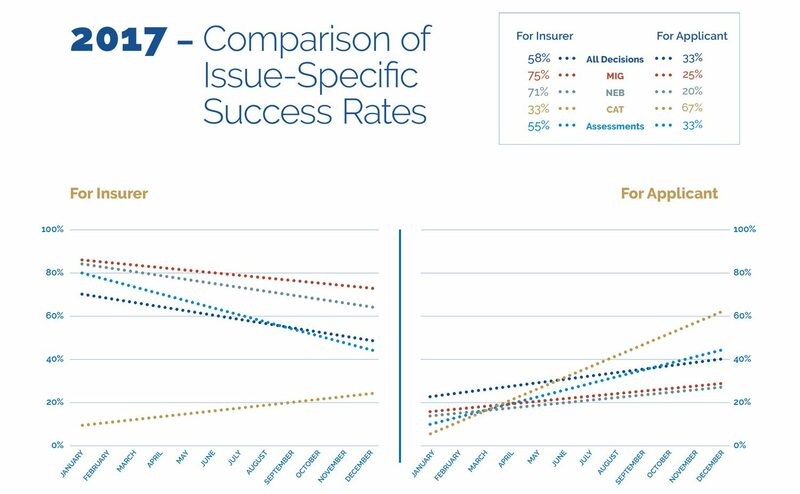 A total of six CAT decisions were released in 2017, with 33% of the decisions in favour of the insurer and 67% in favour of the applicant. It may be premature to suggest there is a trend on this sample size, however these decisions may provide insight into to how the LAT decides CAT issues, as well as how the LAT articulates the principles on which it will build its own case law and interpret the new 2016 CAT definitions. 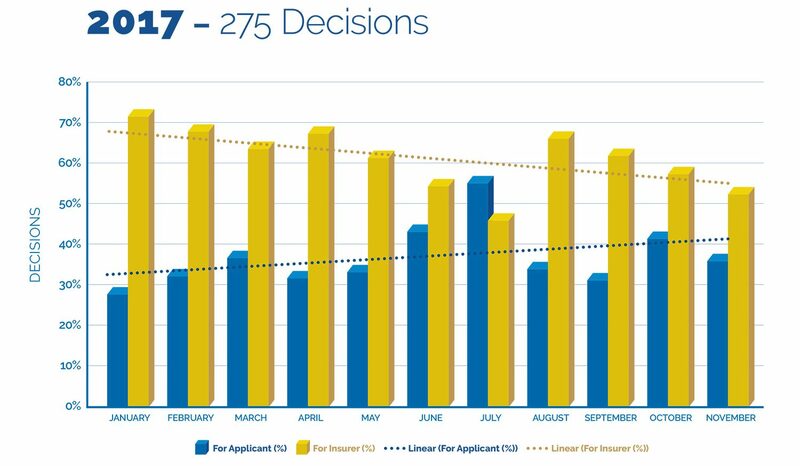 A total of 82 decisions were released in 2017, with 55% of the decisions in favour of the insurer, 33% in favour of the applicant, and 12% split decisions, again in that both parties were successful to some degree. In this instance, there is clear evidence of convergence over the course of the year, specifically beginning in the third quarter. Of the 368 decisions released by the LAT in 2017, the LAT referenced their own decisions in 56 cases. This results in an upward trend of 15%. It is worth mentioning that 42 of the 56 decisions including LAT citations were rendered in the latter half. This is not surprising given the growing database. The rate at which information is made available on CanLII has been steadily improving. In the last quarter of 2016, the average release date to publication on CanLII was 80 days. In each subsequent quarter of 2017, the lag time was reduced, with the fourth quarter averaging 22 days between release to publication. So… the LAT Year 2 – Have we settled in? With decisions trending at the rate of 58% in favour of the insurer and 33% in favour of the applicant, and split decisions of 9% on the rise, it begs the question of whether stakeholders can really afford the cost of either outcome? The ability to reliably predict the likely outcome of any dispute is fundamental to your risk assessment. Securing access to timely information and trends is paramount in achieving this. Can stakeholders accept what seems to be ‘settling in’ as a pattern — or can they find a way to move the needle? This is interesting content for me.